The global market for tartaric acid is fueled by the rising production of wine in Latin America and Asia Pacific, according to a new report published by Transparency Market Research. The report, titled “Tartaric Acid Market - Global Industry Analysis, Size, Share, Growth, Trends and Forecast 2014 - 2022” also states that driven by the growing demand for excipients in the pharmaceutical sector, the global tartaric acid market will develop at a 6.20% CAGR from 2014 to 2022. By value, the market is estimated to rise from US$1.8 Bn in 2013 to US$3.1 Bn by 2022. While the growth of the construction industry in the Gulf Cooperation Council region will push the tartaric acid market over the next seven years, limited use of synthetic tartaric acid in Europe and seasonality of raw materials in the production process is likely to challenge the development of the tartaric acid market.On the basis of end user, the tartaric acid market is segmented into food and beverages, construction, wine, pharmaceutical, leather tanning, chemical, and metal finishing. In 2013, the food and beverages industry accounted for 25.0% of the overall tartaric acid market, making it the largest end-use segment in terms of volume. Wine is the second-largest segment of the tartaric acid market and pharmaceutical is anticipated to register the highest growth rate from 2014 to 2022. Geographically, the global tartaric acid market is divided into North America, Latin America, Europe, Asia Pacific, and the Middle East and Africa. Accounting for a share of more than 30.0% in 2013, Europe dominates the overall tartaric acid market in terms of volume. However, this region is relatively mature and is anticipated to register an average growth rate by 2022. Identified as the most rapidly growing regional market for tartaric acid, Asia Pacific is projected to be fueled by persistent demand in the food and beverages industry, growing consumption of wine, and increased development in the construction sector. The North America tartaric acid market is driven by strong growth in the wine sector, recovery of the construction industry, and a booming pharmaceutical industry. 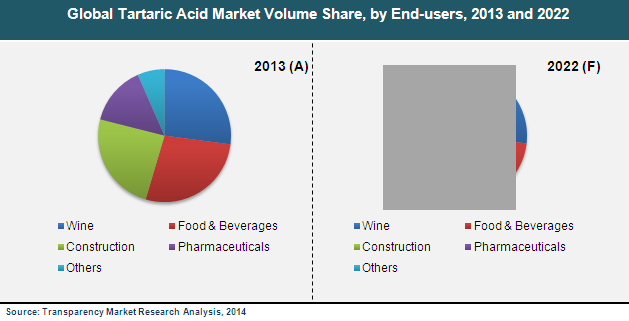 The demand for tartaric acid in Latin America stems from the food and beverages sector, particularly wine. The MEA region is propelled by increased demand for wine and growth of the construction industry in the GCC region. The most prominent players operating in the global tartaric acid market include Vinicas Inc., Changmao Biochemical Engineering Company Ltd., American Tartaric Products Inc., Giovanni Randi S.p.A., Distillerie Mazzari S.p.A., Tarcol S.A., Derivados Vinicos S.A., and Caviro Distillerie S.R.L. These players are profiled in detail in the research report on the basis of aspects such as company and financial overview, upcoming facilities, business strategies, mergers, acquisitions, and joint ventures, capacity addition, recent developments, and new products.